This new contract contains many hard fought wins for social justice that the school district said it would never grant. These groundbreaking victories are against the abuses of high-stakes standardized testing, for more recess, and for race and equity teams in the schools are a dramatic departure from our previous broken model of collective bargaining and hold the potential to transform educator unionism in the nation. Yet the contract also contained some needless concessions to corporate style reforms—including succumbing to the district’s disrespectful pay raise offer, raising caseloads for some special education teachers, extending the school day and reducing teacher planning time—that could have been avoided if the union had kept the picket lines up for a few days longer and organized mass mobilizations. But the most important outcome of this contract negotiation won’t be found in the fine print of the agreement. The true triumph of this contract battle was the achievement of solidarity—between teachers, office professionals, nurses, school librarians, instructional assistants, parents, and community organizations—in the struggle for the public schools. Thousands of parents joined in solidarity with the teachers, including the celebrated “Soup for Teachers” group that formed to bring sustenance and solidarity to picket lines at every school in the district. The Coalition for the Schools Seattle Deserves united community organizations and joined the great Kimya Dawson to host a benefit concert to raise funds for the striking teachers. 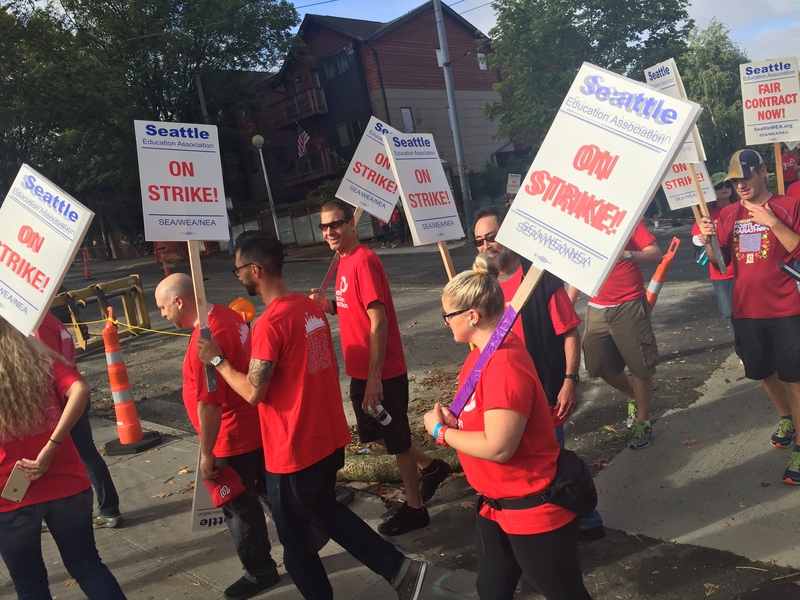 The Seattle City Council, led by councilmember Kshama Sawant, passed a unanimous resolution in support of the strike. Marching band students used their pep-band anthems to root on striking educators, and local businesses donated to the picket lines. Even the mainstream media regularly reported that parents were in support of the strike and that the educators were winning. There can be no doubt that this strike was overwhelmingly supported by the people in the Seattle area–except, perhaps, for the regions’ wealthiest resident, Bill Gates, who has invested his fortune in schemes to privatize education and reduce our schools to test prep centers. So many of the union’s social justice demands were advanced in the current strike and negotiations–creating a compelling model for educators around the country who believe in social justice unionism. We won an end to the use of standardized tests scores being used in teacher evaluations, the so-called “student growth rating”—a huge blow to the testocracy in Seattle and across the country. 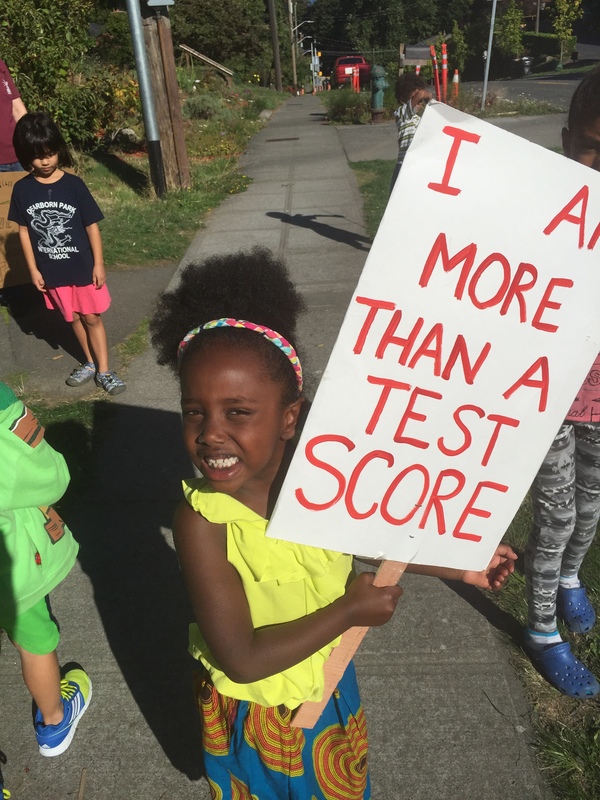 This victory clearly comes out of the years long struggle of educators, students, and parents in Seattle who have taken bold action to oppose these tests. In 2013, the teachers at Garfield voted unanimously to refuse to administer the Measures of Academic Progress test and the boycott spread to some six other schools. Last year in Seattle, every single 11th grader at both Nathan Hale and Center school opted out of the SBAC common core test—joining some 60,000 other opt out across the state. Our victory for a guaranteed minimum of 30 minutes recess in every elementary school is perhaps the first of its kind in the country. A story from a local NPR station in the spring of 2014 exposed the vanishing recess time in the Seattle Public Schools and showed how schools that served low-income students and students of color were particularly recess deficient. All last year I worked with a city-wide organization called “Lunch and Recess Matter,” that organized, petitioned, and rallied for the right to eat and play. This is a concrete victory for a research driven reform that has been shown to be vital for the social and emotional development of children. We also won enforceable caseload caps for our Educational Support Associates (ESAs), such as school psychologists and speech language pathologists—a victory for vital services to support some of our most vulnerable students. One of the most important gains for public education in this contract was the creation of race and equity teams. The Seattle Education Association advocated for every one of the Seattle Public Schools to have such a team to tackle issues of institutional racism–and in so doing won the support of many Black Lives Matter activists, including Seattle NAACP members, who issued a statement supporting the strike. The Seattle school district originally said they would only agree to having these teams in six schools. However, the power of the strike pushed the district to agree to allow thirty schools to have these anti-racist committees. Given that the Seattle schools have been found to suspend African American students at four times the rate of white students for the same infractions, it is clear that every school in the city needs to organize actively against inequality and racism. With this visionary set of demands and the overwhelming support of the parents, students, community, and even city officials, it is truly disappointing that the union ended the strike before we achieved all we could at the bargaining table. Seattle has the fastest rising cost of rent and is among the top ten in highest cost of living in the nation. Educators have not had a cost of living increase in six years, and are increasingly unable to live in the city where we teach. It was a mistake to agree to 3% raise the first year, a 2% raise the second, and a 4.5 % raise the third, which won’t do much to even off set our rising cost of healthcare. With this contract, nurses in the Seattle Public schools will still have to split their time between several schools and can’t possibly provide the care that our students deserve. We achieved lower student to teacher ratios in some preschool and Distinct special education programs, but increased the special education “Access” programs caseload by 30%, going from 10:1:3 to 13:1:3 (student:teacher:instructional assistant). With the current ratios the Access students are able to participate in the general education curriculum and setting with support, however the new ratios put that inclusion model in jeopardy and will overwhelm Access case managers. We also submitted to the district’s demand to lengthen the school day by 20 minutes, which will reduce teacher planning time. There is no definitive evidence that a longer day produces better student outcomes, but we do know it will increase the burden on educators. All that said, I also know our strike has already gone a long way in transforming our union, city politics, and the labor movement for the better. So many educators, parents, students, and community members, in Seattle and around the nation, understand the issues that we face in education so much better as a result of this struggle. With so many more parents made aware of the dangers of over-testing by this strike, the opt out movement in Seattle will be truly massive this spring. The issue of disproportionate discipline as a component of the school-to-prison-pipeline has now been exposed in our city and I believe this will help embolden the Black Lives Matter movement in the coming months. So many in our city have been made aware of the need to fully fund our schools at the state level and I believe teachers, parents, and students will collaborate more than ever in challenging the state legislature to live up to its constitutional duty to amply provide the resources needed to run our schools. As the Social Equality Educators—a rank and file organization of educators in Seattle—recently wrote, “The sleeping giant of our union has awoken from its slumber and begun to stretch its muscles. 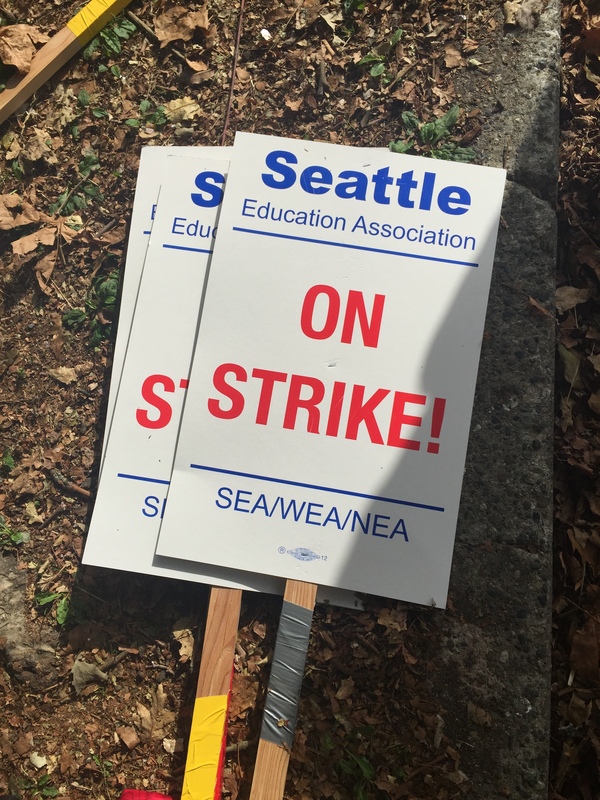 SEA members showed a tremendous amount of creativity and courage on the picket lines.” When our union fully commits to using this newfound strength, the corporate reform bullies will be once and for all chased out of the schoolyard. Jesse Hagopian teaches history and is the adviser to the Black Student Union at Garfield High School–the site of the historic boycott of the MAP test in 2013–and is an associate editor for the acclaimed Rethinking Schools magazine. Jesse is the editor of More Than a Score: The New Uprising Against High-Stakes Testing.